This installment of the damn cool “Letters from the Flaming Crab”-series of oddball, unconventional pdfs clocks in at 20 pages, 1 page front cover, 1 page editorial, 2 pages of SRD, leaving us with 16 pages of content so let’s take a look! This pdf addresses a concern I have encountered in my games a couple of times, and from what I’ve heard, I am not alone. You see, my games tend to be pretty serious affairs and feature some darker themes; as such, faires and circuses tend to result in…ehem…unpleasant adventures…to the point where my players have become suitably paranoid regarding county faires…which feeds into the law of diminishing returns. This pdf, then, would actually provide rules for county faires that are not based on lethal horrors; after a nice flyer and introduction, we are introduced to a variety of games. The games are provided with notes on how they work, the entry fee, the prize and a brief, fluffy note on the respective game runner. The first would pertain picking the correct key to opening a chest from a selection, with various difficulties included. The second would be a dwarven tradition – the chug run: 2 minutes, several booths and the goal of chugging drinks and moving to the next booth…which can be pretty hilarious if your simulate it…and yep, it has notes on cheating. Rules for egg races and flagpole climbing can also be found here. The chili-eating contest flame mouth would be one I’d love to participate in real life. I also love the contest to throw dolls representing Lady Strongarm towards the tower, where Prince Dazzling is held captive – and here would be as good a place as any to note that relevant skills, here Knowledge (engineering), while not required, do help, grounding the games in the mechanics of the rules. Speaking of which: Modifications to the settlement’s GP cap and the like are included, showing a nice attention to detail. Beyond aforementioned mini-games, the pdf also features several events, from animal riders to dancing grounds, livestock contests and gambling, there are a lot of things to do…have I mentioned the masquerade or the shooting competitions. While not all of these feature mechanical effects, several do…though I’m a bit bummed that druids etc. don’t get an edge in the livestock challenge. Of course, food is an integral component of a faire -and beyond the more mundane offerings, we actually get more of the cool culinary magic: Fire-grilled Ba-corn Cobs, for example…which are surprisingly tasty! Yep, much like in the book, you can actually recreate these recipes. The lavender-infused lemonade is decent (I added sparkle to mine, though) and mulled wine helping against the cold…well, you can observe that every day in wintery Germany. Cinnamon Dough Rings can help versus age penalties (and taste delicious) and artistically cut onions can inspire indeed. The respective food is organized by stand, all enhancing the (optional) leitmotif of the Fantasia County Faire that suffuses the pdf like a metaplot. The pdf also contains a mini-adventure, dubbed Fireworks at the Faire, intended for characters level 1 – 2. To talk about that one, I have to go into SPOILERS, so potential players should jump to the conclusion. Pretty amazing: We actually get a map of the faire, including a cool, player-friendly iteration! Editing and formatting are very good – apart from an instance where a bolded header wasn’t bolded, I noticed no grievous glitches. Layout adheres to Flaming Crab Games’ two-column full-color standard and the artwork featured would be neat, original b/w-pencil drawings. The pdf comes fully bookmarked for your convenience. …but honestly, perhaps you shouldn’t. I actually restrained myself and, for once, did not make everything turn sour…and frankly, the experience, in spite of this, was truly refreshing. The mini-games featured herein make for great “traditions” to scavenge for festivals and ceremonies; the maps are a great addition and the wholesome, fun tone make this an inspired, fun supplement I thoroughly enjoyed and wholeheartedly recommend. 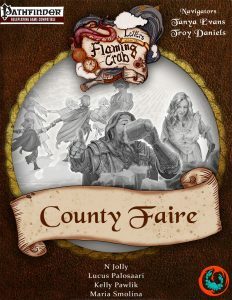 Hence, I leave this county faire pdf like you want to leave any faire in real life: Satisfied and with a wide smile. My final verdict will clock in at 5 stars seal of approval.